Materials Today Communications is a brand new journal, dedicated to the rapid publication of scientifically and ethically sound research. Rather than request authors to submit articles directly to the new journal, Materials Today Communications uses a novel transfer process whereby articles are first assessed by the highly experienced Editors of Elsevier’s leading materials science journals. Following rigorous peer-review, the Editors of these high impact journals may accept articles for publication in their high-impact subject focused journals or instead recommend publication in Materials Today Communications, without further review. Such a process means that the same manuscript need not be re-reviewed multiple times by numerous Editors and Referees, allowing technically sound articles to be published without delay. Dr Stewart Bland, Editor of Materials Today, says he is delighted with the new addition to the family. 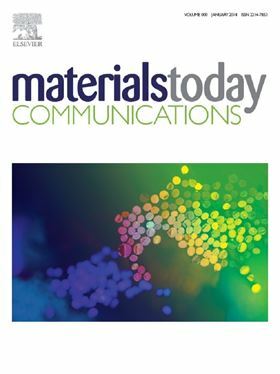 “Materials Today Communications not only represents a streamlined, modern service for researchers, be they Authors, Referees or Readers, but is also a next step in Materials Today’s mission to aid the sharing of materials science knowledge and experience - by drawing on the combined knowledge and experience of the Authors, Referees or Editors of Materials Today’s sister publications”. Submissions to Materials Today Communications are now open via the journals Polymer and Composite Science & Technology, with more routes to come very soon. “It's an innovative project that I am excited as managing editor to be a part of.” Dr Tomas Martin, Managing Editor of Materials Today Communications, from the University of Oxford. Dr Tomas Martin from the University of Oxford will oversee the new journal as Managing Editor. “It's an innovative project that I am excited as managing editor to be a part of.”, said Dr Martin, “We have already seen a number of interesting articles that would have otherwise faced delays prior to publication. In time we hope that Materials Today Communications will both showcase scientific work across a broad range of material science disciplines, as well as make the publication process much easier and quicker. Articles submitted to Polymer and Composite Science & Technology will now be considered for publication in Materials Today Communications. Authors wishing to make their accepted articles Open Access may do so for a fee of $1000.